New fossil finds are challenging the idea that six disparate orders of African mammals  elephants, sea cows, aardvarks, elephant shrews, hyraxes, and golden moles and tenrecs  all evolved from a single common ancestor isolated on the continent of Africa by the breakup of Gondwana about 100 million years ago. 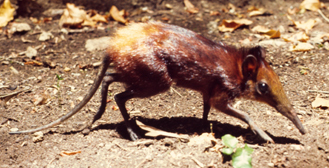 The endangered golden-rumped sengi or elephant shrew, about the size of a rabbit, is one of 15 species of elephant shrews, which live only in Africa. Elephant shrews were originally named for their trunk-like snout, not because zoologists thought that they were related to elephants. Ironically, a recent hypothesis based on molecular evidence now groups them into a superorder called Afrotheria that includes elephants. Photo courtesy of Galen Rathbun, California Academy of Sciences. The hypothesis, put forth in 1998, classifies the six mammalian orders as a superorder called Afrotheria, based on molecular biology studies that found many DNA sequences in common among modern members of the group. Most living afrotheres are endemic to Africa. However, the discovery in North America of a 54-million-year-old fossil of an extinct relative of modern elephant shrews, the oldest found to date, is casting doubt on the groups origin. Such a discovery, which predates any African record, suggests that the common ancestor did not arise in Africa. This paper has very appropriately raised the possibility that Afrotheria is not African, says Robert Asher, curator of mammals at the Museum of Natural History at Humboldt University in Berlin, Germany, who specializes in the study of afrotheres and is not involved with the recent study. The new finding, the researchers say, also supports other fossil evidence that suggests the ancestors of modern afrotheres could have migrated later to Africa from Asia, or from North America through Beringia and Asia. The fossil, encased in hematite, was actually unearthed decades ago from the early-Eocene Willwood Formation in the Bighorn Basin of Wyoming, says Shawn Zack, a graduate student in functional anatomy at the Johns Hopkins University School of Medicine in Baltimore, Md. But the bones were only recently rediscovered and identified by Zack and colleagues as belonging to Apheliscus chydaeus, a member of a group called condylarths, early hoofed mammals that were present in North America. Working with Jonathan Bloch, assistant curator of vertebrate paleontology at the Florida Museum of Natural History at the University of Florida in Gainesville, Zacks team realized that some fossils in the Florida museums collection might be related as well. Comparing the leg and foot bones to those of living elephant shrews, they concluded that condylarths are closely related to modern elephant shrews, which they described in the March 24 Nature. Other studies, based on jaws and teeth, had previously suggested a possible link between condylarths and modern elephant shrews, Zack says. But some are not convinced that the new fossil is actually an afrothere, saying that similarities could have evolved independently, a point the authors acknowledge. The new discovery also highlights an ongoing debate in paleontology over how best to determine evolutionary relationships. Molecular phylogeny determines relationships based on genetic similarities in DNA or proteins of modern descendants, while morphological phylogeny determines relationships by studying the anatomy of living and extinct animals. Some morphologists say that while some group members are indeed closely related, such as sea cows and elephants, those orders are too different from the insect-eating aardvarks and golden moles to be classified together. However, Seiffert says, some modern taxa, such as horses, tapirs and rhinos, have ancestors so similar to hyraxes that, had they gone extinct and left no DNA, we might come to the [incorrect] conclusion that they were afrotherians based on morphology, he says.